Everyone tells me what a gorgeous girl I am, but somehow that does not fuel my self-confidence. You see, my first home was with a commercial breeder where I had little contact with anything outside my kennel. When I went to live at my AGaG foster home everything was new to me. There were so many scary sounds and sights that I just stayed curled up in the corner of the couch and only left my spot to eat when no one was looking. Over time, I learned a lot from watching and interacting with my three foster siblings. I am slowly discovering that being a dog can be fun! I enjoy being rewarded with something yummy called “cookies”, car rides, running at the park and cuddling with my foster mom before bed. I even wag my tail at the sound of my name! I still need patient understanding of my shy and reserved demeanor, slow introductions to new situations, and a family who will delight in the progress I make in baby steps. My forever home will need a fenced yard and at least one other dog to be my mentor and help me expand my golden world. 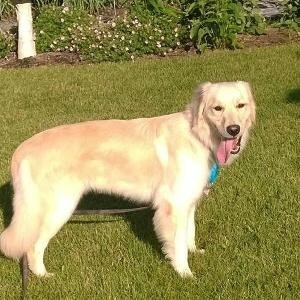 I may never be your typical golden with that social, loving personality, but I am still a very sweet girl. So, you get the hint, right? I am a fearful dog so if you have experience with dogs like me, that is a plus. Are you ready to help me continue my transition? Then I may be just the girl for you!